If you find yourself in Germany with children during the fall, why not take them apple picking? 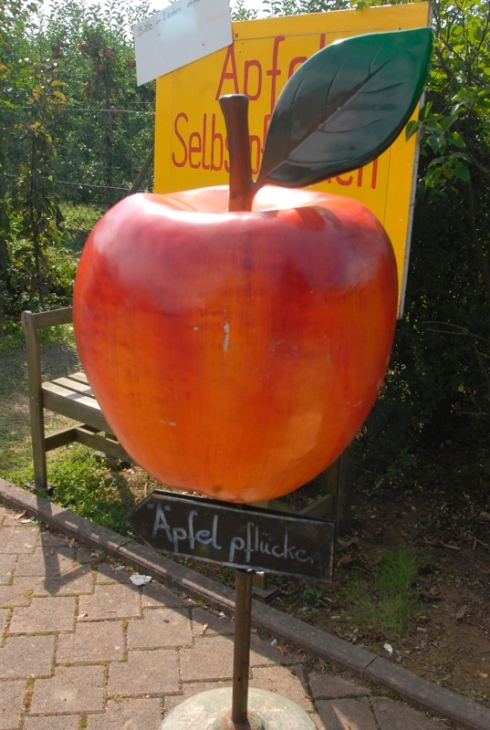 Appel-Happel is a large family-owned apple farm in the Rhineland countryside near the city of Mainz. The friendly farmers here love children and school groups and offer lots of hands-on demonstrations about what they do, what they grow, and the health benefits of eating fruits and vegetables. Outside the store next to the orchards, you can sample the many different varieties of apples they grow before you start picking. 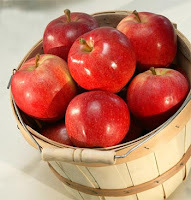 Besides apples, one can pick peaches, pears, walnuts, berries, and much more when in season. Appel-Happel also makes their own marmalades, fresh pressed juices, wines and vinegars. There's even a kid-sized trampoline and a picnic area. Hours are Monday - Friday from 9:30 a.m. to 12:30 p.m. and then again from 3:00 p.m. to 6:30 p.m., and on Saturdays from 9:00 a.m. to 1:00 p.m. I love the name. You just have to smile when you read it! Apple picking is such a fun fall activity. The apples in the basket are almost too beautiful to eat.